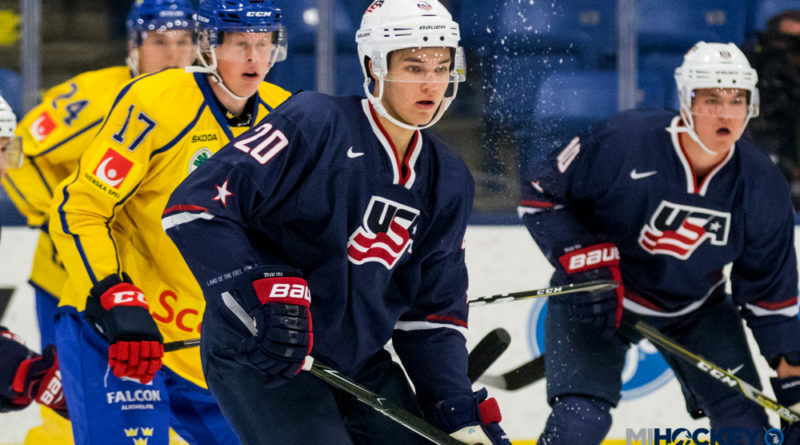 USA Hockey has announced its preliminary roster for the upcoming World Junior Championship, and Michigan will be well-represented. This year’s 2019 International Ice Hockey Federation World Junior Championship will take place in Vancouver and Victoria, British Columbia. It takes place from Dec. 26, 2018 through Jan. 5, 2019. Detroit native John Vanbiesbrouck, the assistant director of hockey operations for USA Hockey, is serving as the team’s general manager. Vanbiesbrouck was on NHL Network to help unveil the roster this afternoon. Minnesota State head coach Mike Hastings will be leading this year’s squad; he is joined by assistant coaches David Lassonde (Dartmouth), Steve Miller (Ohio State), Scott Sandelin (Minnesota Duluth) and Jerry Keefe (Northeastern). Team USA has come home with a medal in three-straight World Junior Championships for the first time; the Americans won gold in 2017 and bronze in 2016 and 2017. Thirteen players who have previously or are currently playing for USA Hockey’s National Team Development Program are on the roster (as seen above). Additionally, 25 of the players have played in or are currently playing in the USHL.